Guru N-Gauge Line This is a high-tech Japanese mono that’s as good as they come. One thing that the development team was adamant about was that the diameter should be absolutely consistent because it was felt that a number of competitor lines were not and the potential to mislead the angler was present. Steve Ringer wanted to make sure that N-Gauge was rated properly for the consumer, yet while still offering unparalleled breaking strain. Lengthy research and field-testing led to the finished N-Gauge. N-Gauge is available in 4lb, 5lb, 6lb, 7lb, 9lb, 12lb breaking strains, which will cover all commercial-water fishing as well as most specialist-angling situations. N-Gauge is super clear, which makes it suitable for even the most gin-clear of waters holding the wariest quarry. It is available on 100m spools, which represents great value for money. 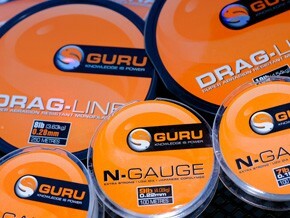 FREE Delivery on all Guru Hook Length over £100!! !